XPIN Clip allows you to get user passcode from iPhone, iPad on iOS 7.x.x and PIN, Backup PIN, Pattern Lock from Android phones/tablets which support USB OTG. ** - If the device is set to erase the phone after 10 incorrect attempts to enter your passcode , your data will be deleted! TIP: How to check if the phone or tablet will be work with XPIN Clip? 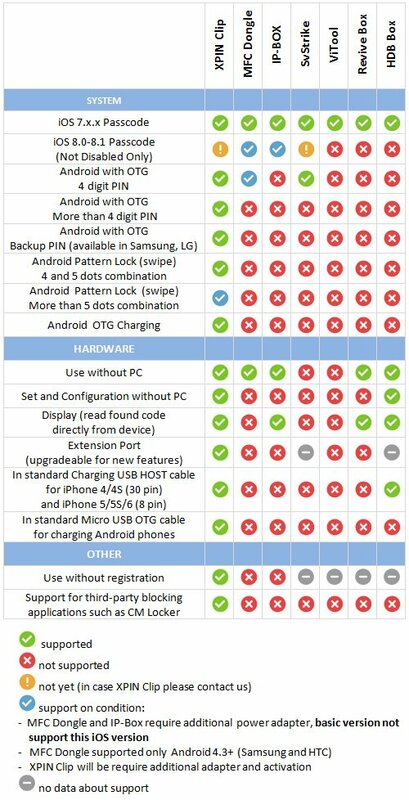 You will need a USB OTG cable and USB keyboard or mouse, just connect them to the phone and check if they have been detected. XPIN Clip - 1 pc. JACK cable with light sensor - 1 pc. USB HOST 3-in-1 with charging for iPhone/iPad/micro USB - 1 pc. Cable OTG micro USB for Android with charging option - 1 pc.